Bake a sheet cake the size that you need. Cut a large oval out of the cake. 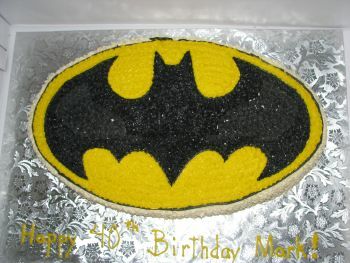 With an icing filled bag and round tip #5 draw the batman symbol on the cake top. Make a black icing and use round tip #7 and outline the batman symbol and the outside edge of the oval. Use the star tip #18 and black icing and fill in the batman symbol. Make a yellow icing and using the size #18 star tip fill in the background area around the symbol. Fill in the sides of the cake with white icing and the same size #18 star tip. Use the round tip #5 and write the message on the cake board.